Building that houses one of the university’s faculties (arts pavilion, music pavilion, law pavilion, etc.). Buildings and campuses that make up an institution of higher learning. 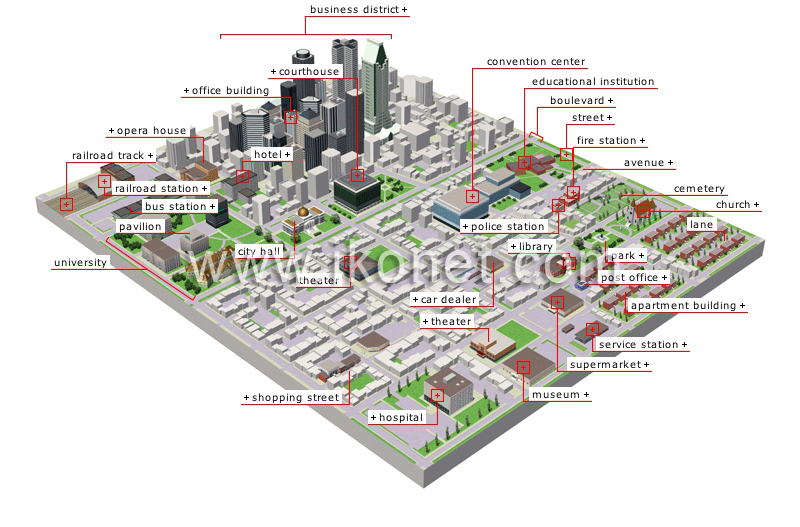 Area that contains most of the buildings in which the city’s economic activities are carried out (head offices, offices, banks, etc.). Building that houses educational facilities (school, junior college, university, etc.). Building with several floors and apartments. Area of a city where trees are planted; it is used for leisure. Narrow road usually situated behind buildings; a lane allows public service vehicles to pass (waste collection, fire trucks, etc. ).